Here at T3 we love the Philips Hue smart light series, and so we're very happy to be able to bring to you the cheapest prices and deals for all the lights, bulbs, lamps, starter kits and accessories in the current Philips Hue range. If you're looking to get started with Hue, or to add to an existing collection, you're in the best place to find the best Philips Hue deals and prices. We've searched far and wide across the internet to find the lowest prices on the Philips Hue starter kits, Hue bulbs, lightstrips, dimmer switches, Go lamps and much more besides. We'll explain what each bit of kit does and why you might want to add it to your home. If you're looking for clarification on which Philips Hue bulb type or fixture fitting to buy, we have everything you need to make an informed buying decision. Philips Hue lights are also a perfect match for home voice assistants, too. If that sounds like something you fancy, take a look at our Google Home deals and Amazon Echo deals pages when you're done here. This is our top recommendation if you're just getting started with Philips Hue, as it includes three Richer Colour bulbs and the Philips Hue Bridge 2.0 base station. With this set you can really kit your home out for parties or just freshen up the ambiance in a room, and provides a good platform you can add to with more bulbs later on. Don't forget to check out the range of Philips Hue apps to find new colour scheme 'recipes' - there's even an Apple app that attempts to mimic your TV's on-screen lighting to enhance the picture with in-room lighting via the camera on your iPhone or iPad. The prices above are for the medium-sized screw bulbs – in the UK, they're known as E27 bulbs, whereas in the US and beyond they're known as Edison or A19 bulbs. Just the same as the bulbs we've mentioned above, but with an old-school British B22 or bayonet fitting. You'll find these in some other remote parts of the globe, but generally they're UK only. You're likely to need bayonet bulbs in the UK if you're using slightly older desk or ceiling lamps – most modern fixtures use screw fittings so do make sure you're buying the right type! Again, you get the Philips Hue Bridge, which handles communication between your bulbs and the app on your smartphone. The final product in the Philips Hue White and Colour Ambiance Starter Kit range is this spotlight bulbs set. This type of bulb is also known as GU10. These are the most modern fixtures of the big three and are generally found in kitchen lighting, cabinets, alcoves and new-build bathrooms. Because most kitchens tend to have at least six spotlight bulbs it can be quite expensive to fill each slot with a Hue bulb so getting the cheapest prices out there is even more important. Be sure to check the 'feet' on the pictures to make sure these match the bulbs you have at home before buying. Note: as things stand, the GU10 Philips Hue Starter Kit is not available in the US. This entry-level Philips Hue White Starter Kit comes with two white bulbs along with the standard Hue Bridge – start here if you just want to dip your toes into the waters of the Philips Hue world. This kit may lack colour or 'temperatures' of white but it still includes smart features like dimmer lighting, timers and remote switching (via your smart devices). We've listed the best prices for the Philips Hue White Starter Kits in each available bulb type below. Unlike the other Philips Hue Starter Kit deals, most of the White Ambiance sets come with a wireless dimmer switch to use anywhere in your home. This might be on a table with your other remotes, or even as an extra light switch if you stick it on a wall (no wires or drilling required) – perfect if any of your existing wall switches require a stumble in the dark before finding it. The White Ambiance bulbs are capable of so much more than the standard white bulbs as they can emit differing shades or temperatures of white light and their dimming range is also a lot more impressive than the standard white bulbs. So you can wind them up to a sharp, bright white light, or chill the scene down with a warmer, natural glow more akin to sunrise/sunset – it's easier on the eyes and a great new way to see your home, and if you're not bothered about multi-coloured bulbs, then these are the ones to go for. As things stand, the Philips Hue White Ambiance Starter Kit is only available with the E29/A19 screw-in bulbs, with either two or three bulbs. The Philips Hue Bridge 2.0 is an essential part of the Philips Hue ecosystem as it's the brain that connects your bulbs and allows you to use them with apps from your phone or connected smart devices (like the Echo Dot or Google Home). You can really go to town with connected, bulbs, lamps and lightstrips too as the Philips Hue Bridge can control up to 50 lights at once. So yes, you can basically turn every room into Vegas, minus the fear and loathing of course. So, if you want to change the colours of the ambiance bulbs, you need to have a Hue Bridge 2.0. If you're yet to buy any Philips Hue bulbs, then your cheapest option to get involved is to buy one of the Philips Hue Starter Kits mentioned above, as it comes with a few bulbs and one of these Philips Hue Bridges. If you already have some bulbs, or are just upgrading from the older Bridge, then these are your best prices for the Philips Hue Bridge 2.0. If you're all set with a starter kit or if you've picked up a Hue Bridge already, we imagine you've caught the Philips Hue disco fever and are on a mission to fill your house with extra white and colour ambiance bulbs. Here you'll find the best prices for the medium-sized screw in bulbs. In the UK, they're categorised as E27, whereas over in the States you may know then as A19 or Edison bulbs. Move along US readers, these little oddities are usually only found in the UK where apparently someone thought it would be great to have an awkward turn and lock bulb that's really fun to change in the dark. Thankfully these ones supposedly have a life of 25,000 hours! The Philips Hue B22 bayonet bulbs have the same functionality as the E27 bulbs above, but with the old-school bayonet fixture. We usually find there's at least one bayonet in UK homes, so this is a handy one-off purchase if you've already bought an E27 screw-in starter kit for you other bulbs. The GU10 bulbs are for spotlights in your home. The prices below are for just one bulb, and seeing as most spotlight areas consist of multiple bulbs (a kitchen ceiling for example), the costs can get out of hand pretty quick. With that in mind. have you considered buying a Hue Bloom or Hue Go lamp instead to do a similar job, for a lot less? We've listed prices for both further down this page too, but if you have the cash to cram your ceiling full of spotlights then we're not going to get in your way. There are so many different names for these bulbs, it can be a bit of nightmare tracking them down. These smaller screw-in bulbs are coded as A12 in the US, A14 in the UK and are also known as candle or candelabra bulbs. This size of bulb is very popular with small lamps, particularly the sort you may have bedside. Annoyingly, Philips doesn't do a starter kit with any of these bulbs yet. If you already have one of the others, chances are these are on you're most wanted list. Be sure to check the fixtures of any lamps before buying though to make sure you need these smaller ones rather than the medium-sized screw-ins found above. If the colour ambiance bulbs are a bit pricey right now, you can save a lot of money by opting for the Philips Hue White Ambiance bulb instead. It's not just the dimmable lighting, or Alexa-enabled control that make this bulb stand out though, it's the ambient degrees of white, or 'temperatures' of light. The short version: there's a natural sunlight feel to the shades of white with modest hints of yellow, white or orange to choose from. Like that gorgeous soft golden firey glow at sunset and sunrise? You can have that as the default at any time of day. Standard white lighting is hard to go back to after this. You'll find the latest and cheapest prices for this bulb with an E27 (UK) or A19 Edison (US) fitting listed below. They're the same bulb, just named differently in the US and UK, seemingly to punish any poor soul trying to write an international article about them. Us British folk are the main crowd for the B22 bayonet bulbs that has seen generations of families back away slowly after attaching it, hoping it doesn't just fall out. At these prices, you definitely don't want that to happen. We do love these bulbs and their natural sunlight glow (well we're presuming it's natural, from that time our grandparents told us about the sun coming out). Looking to replace your existing spotlight bulbs with something a little less harsh than that default sterile white light? The Philips Hue White Ambiance spotlight bulbs are far from cheap, but we've made our way through a comprehensive list of retailers to find the best prices going. Check below for the most recent prices: again these are for individual spotlights, so doing a whole room is going to cost you. These smaller screw-in bulbs are known as E12 in the US and E14 bulbs in the UK. Or you may find them under candelabra/candle bulbs. Again, this is white ambiance bulb, so you're getting multiple temperatures of natural looking light. Most modern bedside lamps use this bulb size and this is a better option than buying a medium-to-small Edison bulb converter to make the larger bulbs work. We looked into this and so many of those converters have wildly differing opinions on the Amazon's reviews, with many of them not working or requiring a bit of connection bending. Just buying the correct bulb sounds much safer to us. This is your most basic Philips Hue bulb out there, and if you're happy with dimmable lighting as the only feature, then these are worth a look. You'll be needing a Hue Bridge or Light Switch to take advantage of that though. The prices below are for the standard medium-sized E27 or A19 screw-in or Edison bulb. If you're after bayonet fittings, we've got those covered further down. Like the bulb above, just a basic white bulb. 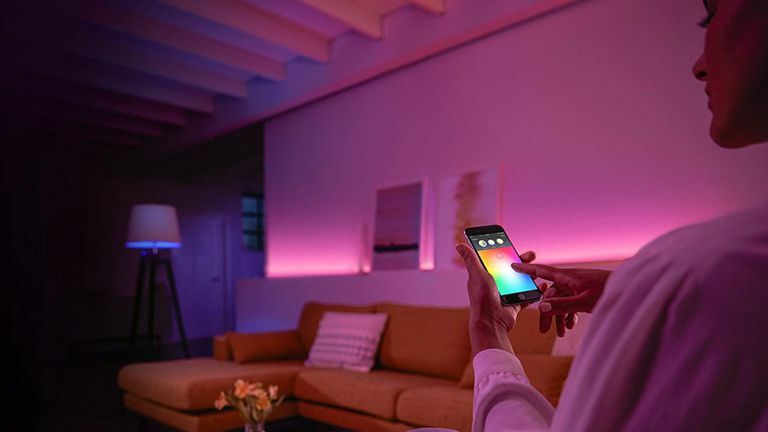 Make sure you're picking up the Hue Bridge or the Hue Light Switch to take advantage of the smart features like dimmable lighting or remote switching. If you're not bothered about any of this, there's not much point in paying this much for a bulb! The chart below is for UK buyers looking for B22, aka bayonet bulbs. Apparently the world was happy to embrace David Beckham, Downton Abbey and the English language, but not our awkward, clumsy light bulbs. Can't think why. Fancy half a sphere of warm glowing light to add some multicoloured style to your home? Then you'll need the Philips Hue Go. This LED lamp can lie flat, or at an angle and looks great on its own, or turned to face a wall to illuminate it in a large spread. The light isn't too bright if you have it facing into the room either (whereas the Hue Bloom is a bit too piercing to look at directly). Oh, and just in-case you were wondering, it's not a bowl: it's a solid half ball. The Philips Hue Go is powered via a mains plug, but can also work wirelessly for up to three hours via the built-in rechargeable battery, meaning you can take it outside or move it to where it looks best for parties or experiment with the best area of a room to place it without cables getting in the way. Every Hue Go is capable of showing colours from a range some 16 million strong, so don't think they only come in individual colours – the ones shown on retailer sites are just examples of what it can do. You won't be stuck with red, blue or green for example. The Philips Hue Bloom is similar to the lamp-like Philips Hue Go above as far as room lighting goes. It lacks the portable features of the Go though and emits a harsher looking light when viewed directly thanks to its thinner bulb cover, but it's generally more effective when turned to face a wall to bathe a side of the room in colour. The Go is more of a party piece favourite, to be placed in prominent positions to be shown off. But if you'e after something mainly to lighten up a wall and are happy to tuck it away behind something, then you might as well save a bit of money and opt for this cheaper Philips Hue Bloom. We particularly enjoyed putting it behind/to one side of the TV to light up the wall behind in different colours of our choosing - dark blue for horror, green for football and so on. The Philips Hue Lightstrip Plus is by far the best multi-coloured lightstrip in the business, with a smooth, warm array of colours to choose from via the app. The sticky-tape undercoating means you can put the strip anywhere you want. You don't have to use the sticky version though if you want to keep moving it around the house. We've seen them work under breakfast bars, under tables, behind TVs, around mirrors and more. You can cut them to fit, although we don't really advise this as you can't put them back together. The Philips Hue Lightstrip Plus is 6ft (1.82m) long in the States and two metres in the UK. That's right, America, the Brits are getting 18cm more in their Hue Lightstrips. You can extend your strips further though with the official Philips Hue Lightstrip Extensions as seen below. Note: You need to buy the Philips Hue Lightstrip Plus (see above) before buying these Lightstrip extensions, so don't think you can save a bit of cash by going for these instead. Also, make sure you're buying an actual lightstrip extension rather than a lightstrip cable extension. The latter is just a cable, with no lights on it and sneaks into a lot of search results. The Philips Hue Lightstrip Extension lengths vary on both sides of the pond again with US customers drawing the short straw at 3ft (91cm) compared to a whole metre in the UK. While we love using the voice and mobile controls for Philips Hue products, the idea of motion activated lighting is just oh so cool. It's more than cool though, it's incredible handy and could even make your home safer. Take those visits to the bathroom late at night. Was your home built with the hallway light switch ridiculously far from your bedroom door? Tired of tripping up on shoes/Lego/burglars/pets in the dark as you stumble towards the switch? Say goodbye to those days with the Philips Hue Motion Sensor. Naturally, you'll need to have a Philips Hue light set up in the area you want to light up. We like how the built-in light sensor ensures it won't go off during the day and waste electricity. You can adjust the sensitivity too, just in-case it looks a bit Mordor-like outside during the day. The Hue Motion sensor runs off a pair of AAA batteries too, meaning you can put it anywhere you want rather than be forced to rely on a mains plug. Put it on the floor, on a window sill, table, mount on the wall or even on the fridge door thanks to the magnet, although that might mean getting busted sneaking off for midnight snacks. This handy lightswitch for your Philips Hub bulbs is a technical marvel. It doesn't plug into the mains, it's not wired into the walls and it's not powered by batteries. Instead, the functions are powered by kinetic energy gathered by simply pushing the button themselves. Sounds like solid evidence of witchcraft to us. We'd kindly like all remote controls to be like this going forwards please. Death to the triple A battery! You can program any Philips Hue light in your home with the Philips Hue Tap and access your preset colour schemes, dimmable features or simply power the lights on or off – and as it's not nailed down, you can put it in any room in the house. If you're growing tired of using the app on your phone for the most basic features of Philips Hue lighting, then this could be an essential purchase for you. Did we mention no batteries? Sometimes, a classic switch for your Philips Hue lights is just what you need. Especially if you don't want to be asking Alexa to do everything, or have to get out your phone every time you want to tweak the basic settings of your bulbs. This switch comes with a wall-mountable dock to slot in the Philips Hue Dimmer Switch remote control, so you can place it wherever it'll be most handy. That could be a dark hallway, or right by your front door for when you come home. Being able to remove the switch as an impromptu remote control to put on your coffee table is very handy too, and it's the perfect way to extend a Philips Hue system you've already got in place.